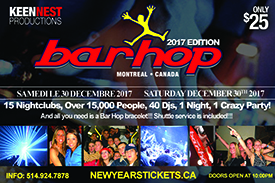 Every ticket sold for this event from Montreal New Years Tickets | NYE is authentic and authorized by Over 15 different nightclubs! 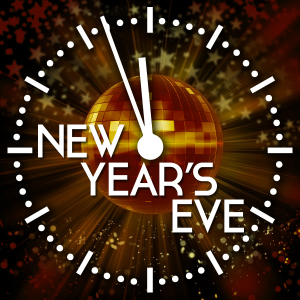 Date of Event: Saturday, December 30th 2017 – 10:00 pm to 3:00 am. Dress code: Dress code required. DJ & Music Type: Playing the Best of House, R&B, Dance, EDM, Mashup, Top 40 and Club Anthems. 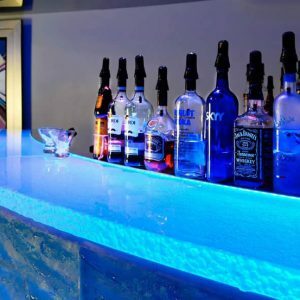 The best in House, Electro, R&B, Mashup, Club Anthem and Top 40. Address: All over downtown Montreal. Table Reservations: Tables are limited and are given out on a first come, first served basis on requested venues. Please contact 514-924-7878 to book your tables. Every clubbers dream comes true. An event that has grown and flourished over the years and this year will count 15 000 people from such cities as New York, Toronto, Boston and Miami! Your bracelet will give free transportation and free access to 15 of the trendiest venues presenting a total of 40 djs.1 Mega Party for only $25. Any tickets which are not picked up in advance will automatically be forwarded to the will call list on the night of the event at COMING SOON. You must bring your Photo ID, purchase receipt, and Credit Card used to make the purchase.